The chart on the left shows the 13-week annualized percentage change in household credit card debt. The data comes from the Fed. As you can see, the use of credit cards to fund spending has soared. Further compounding potential household financial stress, the personal savings rate in November dropped to 2.9% from 3.2% in October. It’s the lowest personal savings rate since November 2007. November 2007 is one month before an official recession was declared back then. The 18% spike in credit card debt is perhaps more troubling than the plunge in the savings rate. It’s been theorized that consumers may have used credit cards to “pre-spend” an anticipated savings in taxes from the tax legislation. Unfortunately, the changes to the tax code will be neutral at best for the average middle class household. 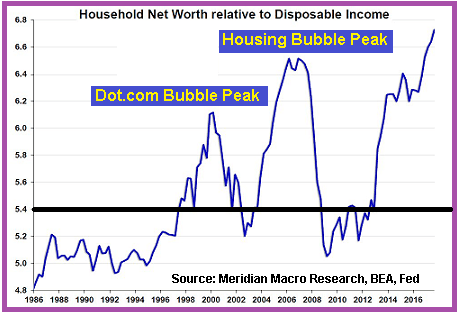 Furthermore, borrowing to fund current consumption in the absence of future income growth or capital gains received from monetizing assets (stocks, homes, etc) merely shifts future consumption into the present. If retail sales come in “hot” for Q4 because of strong holiday sales fueled by credit card debt, it will be offset by a steep decline in consumer spending in 2018. This is because the rate at which consumer credit is rising at more than double the rate of growth in wages. The “cherry” on top of this scenario is that there will likely be an acceleration in the rate of credit card and auto loan delinquencies and defaults. This latter development would a continuation of the rising trend in credit delinquencies and defaults that emerged during 2017. Mortgage payment problems are sure to follow. The “feel good about the economy” propaganda has been over-the-top this year. Trump has been the primary cheerleader as he extols the virtues of a soaring stock market that he labeled “a massive bubble” when he was begging for votes on the campaign trail. Now he points to the stock market as an indicator that the country is better off since he became president. 2018 is going to be a difficult year for most Americans. I have no idea how much longer the stock market can continue transmitting the illusion that every one is becoming more prosperous. I have a gut feeling that real inflation, resulting from the inexorable devaluation of the dollar since 1971, will rip through the system sometime in the next year or two and drive interest rates to a level that could bankrupt a major portion of the economy. It really won’t take much of a bump in rates for this to occur…slowly, then suddenly. You’ve probably heard/read a lot lately about the VIX index. The VIX index is a measure of the implied volatility of S&P 500 index options. 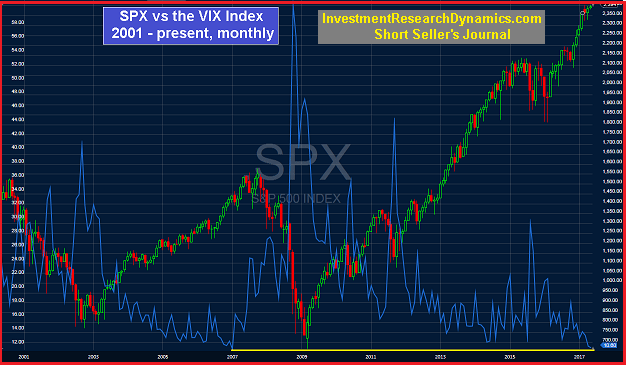 The VIX is popularly known as a market “fear” index. The concept underlying the VIX is that it measures the theoretical expected annualized change in the S&P 500 over the next year. It’s measured in percentage terms. A VIX reading of 10 would imply an expectation that the S&P 500 could move up or down 10% or less over the next year with a 68% degree of probability. The calculation for the VIX is complicated but it basically “extracts” the implied volatility from all out of the money current-month and next month put and call options on the SPX. The graph above plots the S&P 500 (candles) vs. the VIX (blue line) on a monthly basis going back to 2001. As you can see, the last time the VIX trended sideways around the 11 level was from 2005 to early 2007. On Monday (May 8) the VIX traded below 10. The last time it closed below 10 was February 2007. The VIX often functions as a contrarian indicator. As for the predictive value of a low VIX reading, there is a high correlation between an extremely low VIX level and large market declines. However, the VIX does not give us any information about the timing of a big sell-off other than indicate that one will likely (not definitely) occur. In my opinion, an extremely low VIX level, like the current one, is signaling an eventual sell-off that I believe will be quite extreme. The true fundamentals underlying the U.S. economy – as opposed the “fake news” propaganda that emanates from uncovered manholes at the Fed, Wall Street and Capitol Hill – are beginning to slide rapidly. 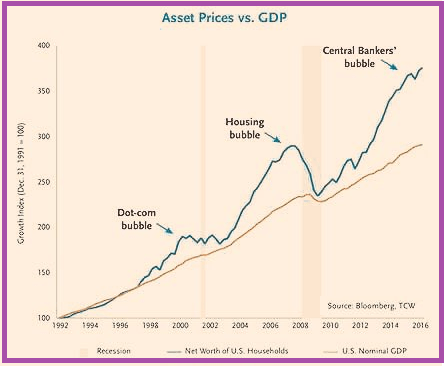 The primary reason for this is that the illusion of wealth creation was facilitated by the inflation of a massive systemic debt and derivatives bubble. Government and corporate debt is at all-time highs. The rate of debt issuance by these two entities accelerated in 2010. Household debt not including mortgages is at an all-time high. Total household debt including mortgages was near an all-time high as of the latest quarter (Q4 2016) for which the all-inclusive data is available. I would be shocked if total household was not at an all-time high as I write this. The fall-out from this record level of U.S. systemic debt is beginning to hit and it will accelerate in 2017. In 2016 corporate bankruptcies were up 25% from from 2015. So far in 2017, 10 big retailers have filed for bankruptcy, with a couple of them completely shutting down and liquidating. Currently there’s at least 9 more large retailers expected to file this year. In addition to big corporate bankruptcies, the State of Connecticut is said to be preparing a bankruptcy filing. The household debt statistics show a consumer that is buried in debt and will likely begin to default on this debt – credit card, auto, personal, student loan and mortgage – at an accelerated rate this year. The delinquency and charge-off statistics from credit card and auto finance companies are already confirming this supposition. In the latest issue of the Short Seller’s Journal, I review the VIX and the deteriorating consumer debt statistics in detail and explain why the brewing financial crisis will be much worse than the one that hit in 2008. 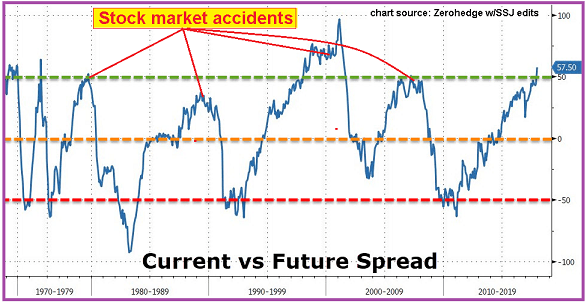 I also present a finance company stock and a housing-related stock as ways to take advantage of the crumbling consumer. You can find out more about subscribing to the Short Seller’s Journal here: Subscription information. There’s no monthly minimum require and subscribers have an opportunity to subscribe to my Mining Stock Journal for half-price.